The Pac-tec 200 is made by Highlander, a Scottish outdoor equipment manufacturer since 1985. Visually, this appears to be a well made bag; the stitching was even & tight and whilst there were a couple of loose ends there was nothing overly concerning about the quality of the finish. Feature-wise, all the basics were there ie a decent shoulder baffle, a zip baffle, a hood plus an internal pocket - tho' I wonder if I would ever really use this and risk lying on something valuable - or sharp?. The bag also comes with its own stuff-sac - into which I managed to get the bag after use and compress it down to 36cms x 17cms x 18 cms. There is a two-way zip which on the whole ran pretty well although on occasion did catch in the zip baffle. So far I've tried it out on an Autumn night during a short Peak District walking trip in a motor home. The temperature was approximately 8 degrees C. I'm average build, 5'8'' and probably do tend to 'feel the cold'. I had a large size bag and this was a comfortable fit for me. There's a decent sized foot box - with enough room to fit a hot water bottle if so desired! The hood wasn't too claustrophobic and the collar did pretty well fill the gap between my neck and shoulders without feeling too OTT. Temperature-wise, I'd say I was just about comfortable so - given that I was in a motorhome - I think for use in a tent and on a sleeping mat the stated lower temperature limits are somewhat optimistic. 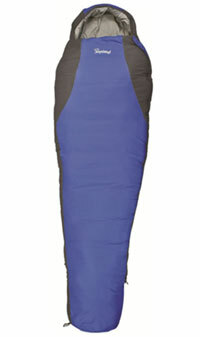 Highlander's Pac-tec 200 is a good value, relatively light-weight sleeping bag. Great for camping with a car, it's probably also just light enough for backpacking trips during Spring, Summer or early Autumn in the UK. The stated lower temperature limits may be optimistic for some.